Russia’s Supreme Court has ruled to uphold the ban of Muslim headgear in schools introduced last fall by authorities in the Republic of Mordovia. Wednesday’s verdict by the Supreme Court rejected a complaint lodged by the Mordovian Muslim community, who claimed that the ban on religious headgear in schools violated the constitutional principle of freedom of conscience. However, as in previous similar cases, the judge ruled that the ban on wearing headscarves in schools did not prevent Muslims from believing in God and did not infringe anyone’s constitutional rights. The Mordovian government’s order banned not only hijabs, but also any clear demonstration of any attributes of any religion. The ban also extends to blue jeans, mini-skirts, low-cut tops, bright makeup or hair dye. The ban on hijabs has caused protests from Muslim believers and clergy, at regional and federal levels. The head of the Mordovian Muslims, Fagim Shafiyev, appealed to prosecutors with a request to investigate the decision of the republic’s government, and Grand Mufti Ravil Gainutdin sent Russian President Vladimir Putin a letter, calling on him to defend the right of Muslim girls to wear the hijab in schools and universities. President Putin expressed his position on the issue of hijabs in 2012, when he opposed them being worn in schools, saying that, although people’s religious feelings must be respected, Russia was a secular state. “We should see how our neighbors, European states deal with [wearing hijabs]. And everything will become clear,” Putin said. 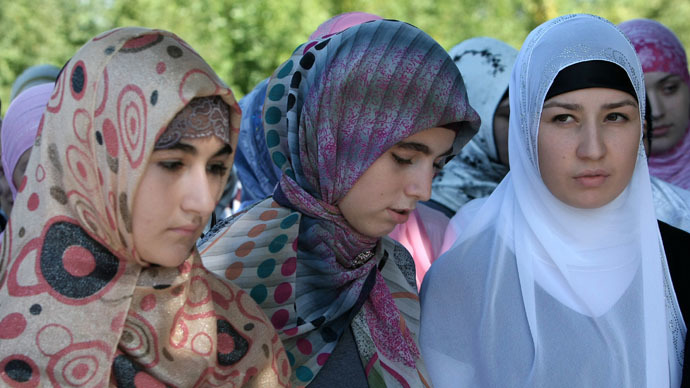 In July 2014, Russia’s Supreme Court also upheld a ban on hijabs and other Muslim headwear in schools by the administration in Russia’s southern Stavropol region.